In what is believed to be a world first for a Pathfinder camporee, a week-long event in the Sepik Mission church region, in Papua New Guinea, was held entirely on water in December 2017. 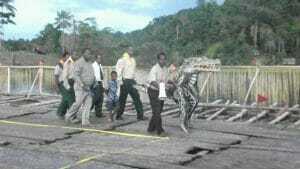 A specially-constructed pontoon, afloat on the Sepik River, in the northern region of the country, was the site for the camporee. The 164 ft x 131 ft (50m x 40m) structure accommodated the 350 Pathfinders and staff, including 47 tents. Fittingly, the theme of the camporee was “Floating in the Arms of God.” Four Pathfinder clubs took part in the 22 water activities. From the Sepik Mission, Amunti District youth coordinator Patrick Maru said planning for the event began three years ago. “[We thought] we wanted to make a change to the usual style of Pathfinder camping,” he said. Maru shared that the program was officially opened by Sepik Mission youth director Missikaram Guguna, assisted by guest speaker Lessley Yamahune, who is stewardship director for the Sepik Mission. They were escorted by the ‘crocodile man,’ the event mascot symbolizing the Sepik River people. Maru said that night he recalled the Bible story about Jesus and the storm, and that gave peace. “That cold rainy, windy night, I cried to Him for help,” he said. The storm was so powerful that large bush ropes and bamboo posts holding the pontoon in position were broken, causing it to begin moving. Fortunately, it remained intact and drifted about 1,000 ft (300m) before coming to rest in a bay. Later that morning, two outboard canoes pushed the pontoon back to its original position. “Pathfinders and leaders have seen the mighty hand of God during our one-week camp. . . and these Pathfinders will have a story to tell their kids in the future,” Maru said. 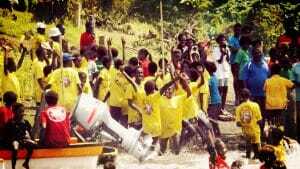 By the end of the week, 47 Pathfinders had been baptized in a baptismal pool in the center of the pontoon. South Pacific Division youth director Nick Kross said it was a unique event. “It may well be the first time in the world that a Pathfinder camporee has been held on water,” he said.